A Peruvian restaurant that has simple surroundings and a friendly staff. You'll find classic Latin dishes here, as well as other global influences that the chef is inspired by. Monday to Friday 10:30 a.m. to 10 p.m., Saturday and Sunday 10 a.m. to 10 p.m. The thick Peruvian seafood soup, aguadito de mariscos, is quite the eye-catcher. A bright spring green, it's sparked with cilantro, loaded with shrimp, squid, crab and mussels. This is the kind of soup that can brighten a wintry night. 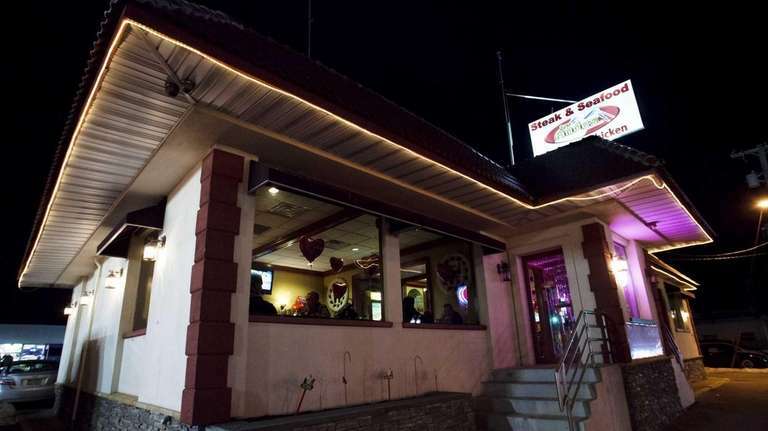 So, too, can many of the other Peruvian dishes served at Los Andes, the Patchogue offshoot of a Deer Park restaurant. Here, surroundings are simple, service friendly, if somewhat less than perfect. Still, you won't mind a half-cleared table between courses, once you and your companions are into a pitcher of the restaurant's heady, fruit-filled sangria. A big hit here is the ceviche encantado de los Andes, a mixture of citrus-marinated white fish and assorted shellfish in a piquant yellow sauce. Like the aguadito, it works as either a shared starter or a main course. 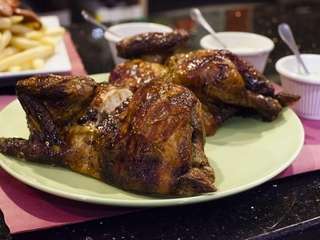 As at most Peruvian restaurants, the main draw at Los Andes is pollo a la brasa, or rotisserie-roasted chicken. The bird is coppery and glistening, every fiber of meat imbued with the flavor of its marinade. You'll find it in any number of family-style combinations that may include a salad plus fries (the pre-frozen variety) tossed with the sliced Peruvian hot dogs called salchipapas. While Latin at heart, the fare of Peru exhibits many global influences. One Asian-inspired dish is chaufa, a close relative of Chinese fried rice. Ordered with shrimp, it's lively, garlicky and ample enough to feed at least four. Then, there's the stir-fry called lomo saltado, a subtly smoky mix of beef, onions and tomatoes served on a bed of fries. And, yes, those fries are supposed to get soggy; Peruvian tradition. An Italianate dish, tallarin verde con pechuga de pollo, features fettuccine with a pesto-like sauce alongside a wafer-thin grilled chicken breast. Despite its appearance, the meat turns out to be moist and juicy; if only the pasta weren't cooked to near-mush. But the kitchen shows skill with its chicharron de pescado, deep-fried strips of marinated tilapia. Camaron al ajillo, garlic-soy shrimp served over rice, hits all the right notes. So, too, does the house-made crema volteada, an especially rich flan. There's also a surprisingly fine chocolate layer cake, brought in from an outside baker. An American influence, perhaps? Los Andes RestaurantLos Andes is a Peruvian restaurant in Patchogue that has simple surroundings and a friendly staff. You'll find classic Latin dishes here, as well as other global influences that the chef is inspired by.